As we get into the summer months many of us geeks begin to think thoughts of sweltering heat and preserving our components from the dreaded hard lock cause by critical system components overheating and beginning to fail. One of the biggest causes of the summertime blue screen blues is the CPU getting too hot and shutting down to preserve itself. While liquid cooling is nothing new to the PC market it has always been a niche group that dare to liquid cool, many people when faced with the daunting expense and potential for catastrophic failure generally decide against introducing liquid to their expensive gaming rigs. Fortunately the cool folks over at CoolIT Systems have brought us a product that promises to introduce liquid cooling at a substantial reduction of cost and risk as opposed to standard liquid cooling. 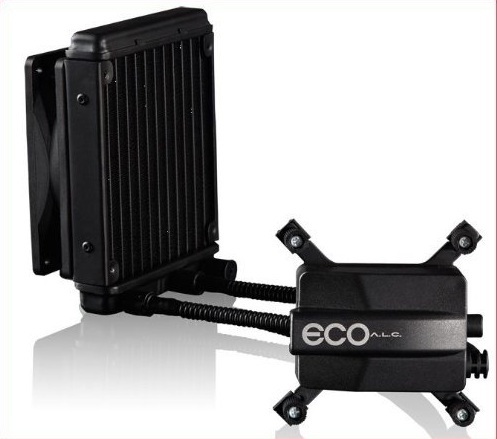 I am happy to introduce ECO A.L.C which stands for Advanced Liquid Cooling and promises to cool your CPU without breaking the bank. Quick to Install Into Any Chassis – The extremely compact ECO A.L.C. comes pre-assembled making it easy to install into any chassis with a few simple steps. Unlike heavy air cooled solutions, the ECO exerts little weight on the motherboard keeping the solution well below the maximums specified by Intel and AMD.